The route map is available as a printed waterproof version, price 10 euros. In the printed map you have information about the aquatic nature trail, the rapids of the route, route description, the services by the route and general information how to act when spending time in the nature. The route starts at the shoreline of Juva Camping and runs for 8 km along Lake Jukajärvi before the first resting place, Haravaniemi (with a shelter providing protection from inclement weather), of the route. The first river stretch, River Polvijoki, begins at the south end of the lake. At the head of River Polvijoki (total length 5,5 km), behind the bridge, there is a dam which must be passed by carrying the canoe. Pass the dam from the right side and canoe can be launched again just after passing the dam. The river is 10 meters wide and there is a drop of four meters. There is a small stretch of rapids at the beginning of the river. Late in the summer the water level in this point might be pretty low. Toivio resting place is located by the River Polvijoki. The route can also be started by Toivio and at the end of the road there is a parking place and latrines. River Polvijoki flows into Lake Riemiö and Riemiö resting place is located at the northern shore of the lake. The route continues through Kapeasalmi and Laajalahti to Lake Souru. At the northern end of the lake there are the first rapids of the route: Voikoski. Voikoski is about 200 meters long, fast flowing and easy. Next comes Lake Voilampi with a small island at the other end. Behind this island you will find Souru resting place, which need to be approached from the RIGHT side of the island. Note that the resting place appears suddenly and BEWARE of the currents caused by the nearby Karikoski dams. From Souru the route continues to the right along a disused log-floating canal (about 500 meters). Next stretch, River Karijoki (5 km), is ideal for canoeist: fast flowing and without obstacles, with the exception of two bridges, which can be passed easily. Lake Kaitajärvi is long and narrow. At the end of the lake there is resting place Oravanpesät with many sevices. As the lake narrows into a river follows Kissakoski rapids which are 600 m long with a drop of 1,6 m. Good current, plenty of water, no rocks; the road bridge can be passed under by stooping. Kissakoski rapids flow into Hyypiönlahti bay of Lake Kyrsyänjärvi. The route continues from there towards the western shore of Kangassaari island, almost directly north and from there along River Kyrsyänjoki which starts at the northern end of the lake. Kyrsyänjoki River has 200-300 meters long rapids with strong currents. It is recommended to use a cover for the canoe. At the end of the rapids the river makes an S-turn. There is a total drop of 1,9 meters in the river. At the end of the river there is Kyrsyä resting place (with a shelter providing protection from inclement weather) on the left bank of the river. The route continues along the eastern shore of Lake Hattulainen northwards towards River Rasakanjoki. This river is 15-20 meters wide and has plenty of water and an easy current. Next coming River Tikanjoki has a drop of 3 meters with surges under the bridge. The river is swift, clear and easy to paddle along. Tikanjoki River flows into Lake Kaislanen which is a eutrophic lake surrounded in the west by swamp and in the south by farm fields. Next stretch of the route is 1,5 km long River Pyöninjoki, which flows into Lake Halmejärvi and comes to its end behind Hämeensaari island. Pass the island from the left side, as the right-hand strait is overgrown with vegetation. The route runs under Virransilta bridge, which is at the north-eastern corner and into angle of Huttulahti bay. On the left shore of Huttulahti, right after the bridge, is Partala resting place. From there the route runs along the western shore of Lake Lohnanjärvi to Lohnankoski rapids. There is a drop of 1,6 meters and a few rocks along the 300 meters stretch of rapids. It is recommended to use a cover for the canoe. Lohnankoski rapids flow into small Lake Myllylampi, which is overgrown with by vegetation but you can be paddle along it close to the bridge. Next stretch of the route is 1,5 km long River Pyöninjoki, which flows into Lake Halmejärvi and comes to its end behind Hämeensaari island. Pass the island from the left side, as the right-hand strait is overgrown with vegetation. The route runs under Virransilta bridge, which is at the north-eastern corner and into angle of Huttulahti bay. On the left shore of Huttulahti, right after the bridge, is Partala resting place. From there the route runs along the western shore of Lake Lohnanjärvi to Lohnankoski rapids. There is a drop of 1,6 meters and a few rocks along the 300 meters stretch of rapids. It is recommended to use a cover for the canoe. Lohnankoski rapids flow into small Lake Myllylampi, which is overgrown with by vegetation but you can be paddle along it close to the bridge. The last lake stretch before Sulkava begins now. Lake Kuhajärvi ends where Hasulanjoki river begins; the river has a few rocks when the water is low. Hasula, the last resting place of the route, is situated on the right bank of Hasulanjoki river; it provided with a shelter. Next stretch is second small Lake Myllylampi, which is rather overgrown by vegetation. Now the route runs along the wide and quiet river. The short and swift Tiittalankoski rapids comes 1 km before Sulkava. The route runs along the impressive River Uitonvirta to the small village of Sulkava. The route ends at Kulkemus Boating Center, which is straight ahead of you on the right after bridge. There is a small jetty especially designed for canoeists between the bigger jetties. You have now arrived in lake Saimaa. The total drop from lake Jukajärvi to lake Saimaa Alanne is 24,3 meters. The route is new and will be opened in the spring of 2017. The finishing touches to the route will be added at a later date. The route starts at Ala-Matkus, 2,6 km from highway 5. To get to the head of the route pass under Pakinmaantie road. There are jetties to make it easy to launch canoes. A stopover with a fireplace and outhouse is provided at the Konnusjoki lean-to. Once you have canoed 3,3 km from the Konnus-joki lean-to, you will reach the Konnusjoensuo shelter. Some 10 km from this point there is a mill (JU215) that you have to get around by carrying your canoe. Downstream the mill you will soon pass under Highway 14. This is followed by a 4 km lake section on the Iso-Kontunen lake. Next you pass through the Kontunen rapids and enter the Syrjä-Keskonen lake. Continue south for about 0,5 km. Right at the head of the river, there is Melasenkoski rapids. After a narrow, river-like strait you come to the Melanen lake. Its close shores direct you straight to the Hirmujoki river. An early sign of Hirmukoski rapids ahead appears in the form of rocks used as foundations for the dam. Upstream of Rapiontie road bridge (SU200) there is a stopover on the bank beneath a red building. Carry the canoe across the road. On the other side of the road, there is a narrow path that takes you back to the river (some 100 metres). The route, flanked by majestic banks, continues downstream in a leisurely fashion to the Murtonen lake. After some 1,5 km, the route passes under a road bridge over the Rekolansalmi strait and enters the Halmejärvi lake. 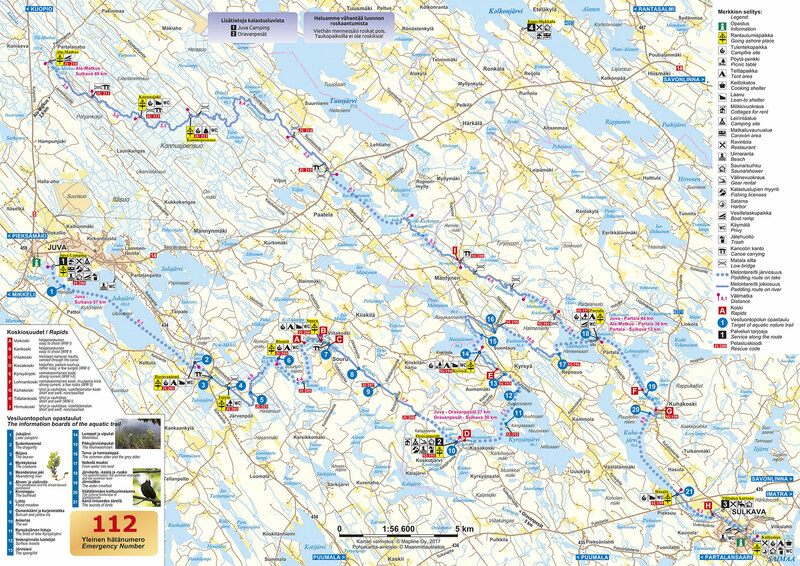 Here the route now joins the existing Oravareitti route allowing you to continue to the Partala stopover located in the north-eastern corner of the Halmejärvi lake. The distance from the route start, at Ala-Matkus, to this spot is around 36 km. It also serves as a pick-up and supply point.